6" A/O Sanding Disc, U612 240-A Grit PSA 6 Hole, 100 pk. 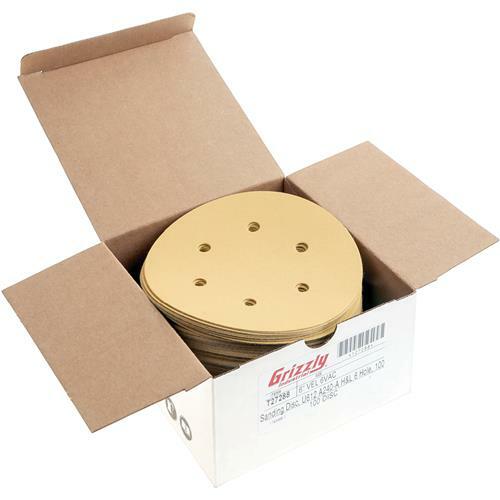 Grizzly T27288 - 6" A/O Sanding Disc, U612 240-A Grit PSA 6 Hole, 100 pk. These gold level aluminum oxide discs from PASCO have a faster rate of cut and longer life versus competitive "A" weight disc products - and for a better price to boot! The backings are resin bonded discs coated with zinc stearate to resist loading and are laminated to resist edge tears. Backs are Hook and Loop (H&L) and include an 8 hole dust collection pattern. 240 grit, 100 discs per roll.